Of picnics, cheese, and roses . . . Isn't this a pretty pattern? It's White Birch by Royal Albert. I was at a friend's last week, and had tea out of this cup. Of course, I had to take a picture of it first. This would be a lovely place for a picnic. Perhaps some homemade, crispy chicken, still a little warm from being made early that morning, potato salad made from a favorite family recipe, fresh blueberry muffins, a cluster of grapes, and later, with a thermos of steaming coffee, some homemade brownies or chocolate layer cake, thick with frosting. You have already been canoeing, and now, nicely sated, you are ready for a little rest on an old, freshly laundered quilt with a favorite book. There's a gentle breeze coming off the lake and, after a bit, the book slowly falls from your hands as you drift off into a pleasant afternoon slumber. Perhaps later, you sit and watch the sunset (can you see it there in the western sky beyond the lake? ), as the fireflies come out and the frogs and crickets begin their evening chorus. Look what I recently discovered . . . Cheese paper. Who knew? I expected a roll of something like waxed paper, but the box contains individual sheets of coated paper with cute little labels. It's supposed to help keep cheese fresher than plastic. In fact, I guess you're never supposed to keep cheese in plastic. It can't breathe, or release the ammonia that is a natural by-product of the aging process. If you don't have cheese paper, you can use waxed paper or parchment paper. If you're worried about the cheese drying out, you can put it in a partially sealed plastic bag after you've wrapped it in the paper. This parmesan cheese was delicious on spaghetti squash with a meat sauce. A far cry from the stuff that came in a green can when I was growing up! 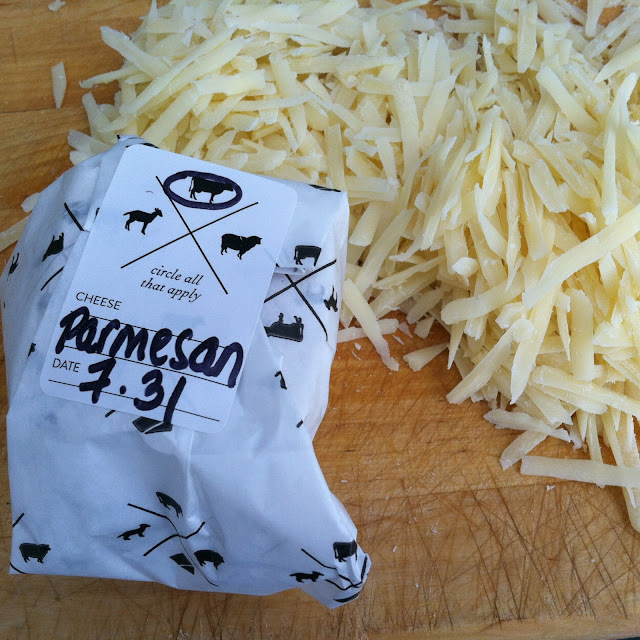 I circled the cow, because that's what this cheese came from, but there's goat and sheep cheese options as well. Cut roses need tending every day. 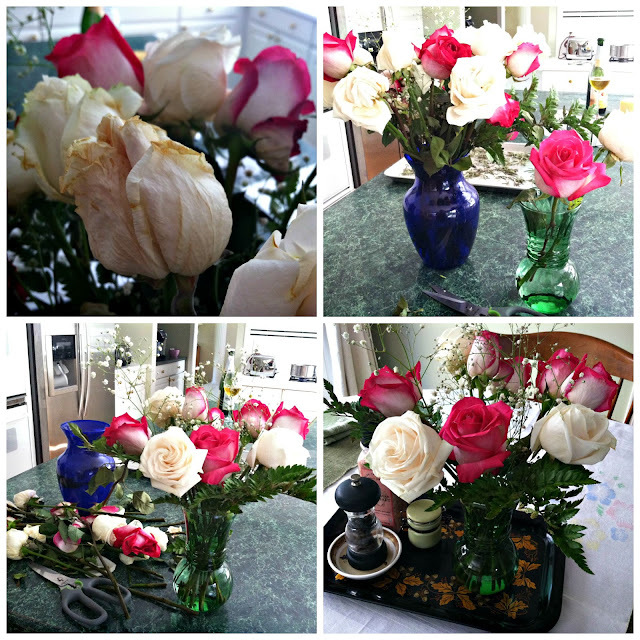 Changing the water, re-cutting the stems, and sadly, discarding the dying ones . 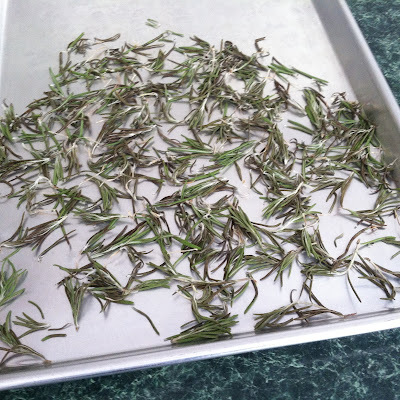 . .
Drying rosemary, my favorite herb on pork and chicken, for later use. Have a beautiful week, friends. And thank you all for visiting. I love and appreciate your comments. Sharing with Rose Chintz Cottage. Yes, the teacup is a beauty, Deborah, and I love how you took me away to escape with you on a delightful make believe picnic. It was wonderful!!! I do use parchment paper for my cheese, and I've never seen the special cheese paper. Thanks for sharing with us. Happy Tea Day, and enjoy your flowers and your herbs. Deborah, This is a wonderful post! That is a gorgeous cup/saucer. I have a friend in Iowa who has birch trees and I'm going to share your post with him/wife. 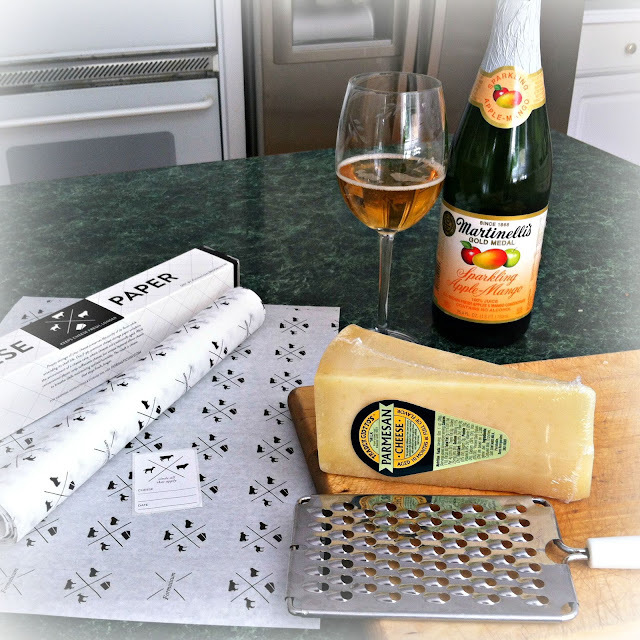 I did not know about the cheese paper; would love to try some as my husband loves cheese. I like your description of the picnic and seeing your herbs makes me long to smell their fragrance. Thank you for a lovely post today. I'm on a blog break - trying to get John's diabetes under control. See ya soon. Isn't it wonderful when someone serves you tea/coffee in such a splendid way? I was beginning to think that this didn't happen any longer. So happey to see it does. Good news about cheese paper. Where did you find it? I have always loved landscape teacups...and yours is a favorite. Definitely perfect for a picnic! Your landscape teacup is to die for! Yep, I too think it's just perfect for a picnic day in the country side. Well, there won't be any cheese paper here. I like the idea. Have a super week my friend. Your lovely teacup is perfect for a summer outing! 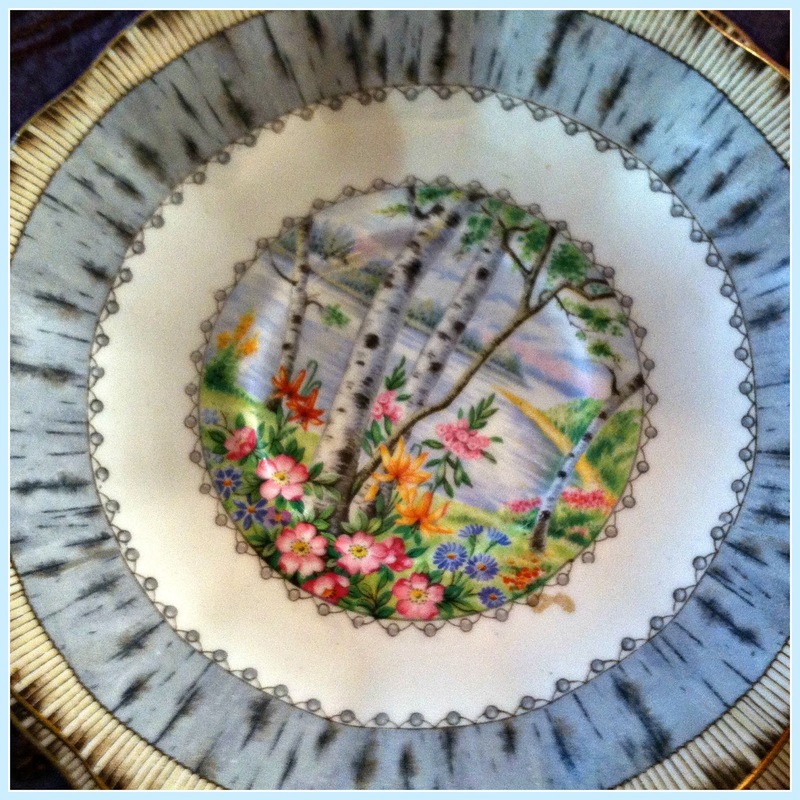 I love that tea cup and saucer and in fact, have a piece of the china hanging on my dining room wall. And I've never heard of the cheese paper before! I'll have to look for it. 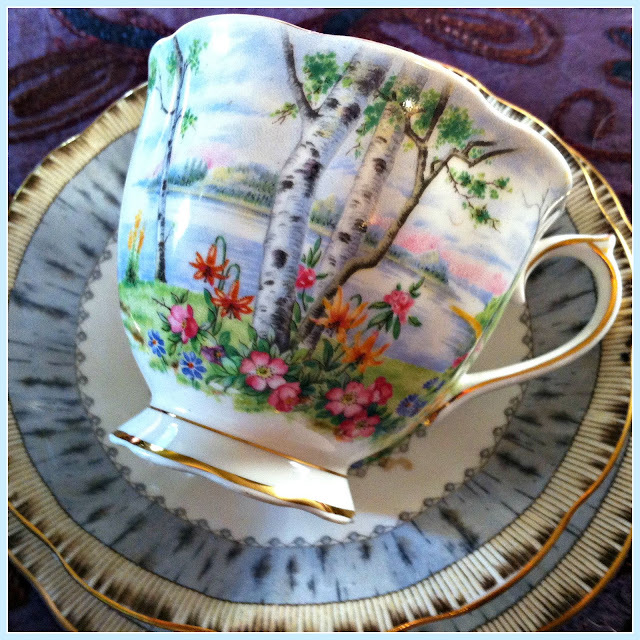 Beautiful teacup and the birch trees remind me of my area. Lots of birch trees in my woods. I enjoyed your lovely make believe picnic! The teacup is a beauty, Deborah, and would be a favourite of mine if it was in my collection. I love scenic/pastoral china. Cheese paper; what a great idea! Your daydream sounds lovely. We spent the day at the beach and drank hot coffee early this morning from our big thermos mugs and enjoyed a picnic at noon. Then we watched the seagulls overhead, listened to the waves, and walked on warm sand. It is my idea of bliss this time of year. Which is why I'm late visiting your post tonight. Thanks for sharing with us and enjoy this new month of August. 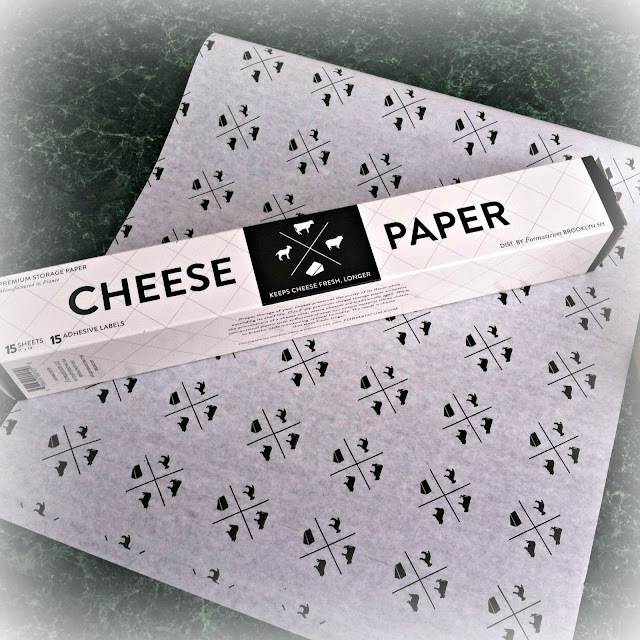 Cheese paper- who knew? What a neat idea. Where did you find it, Deb? I absolutely ADORE that beautiful RA teacup "White Birch." It's truly one of the most beautiful, isn't it? How nice you got such good pics of it to share! ps come visit my blog today. Love the teacup/saucer I have never come across the pattern before, beautiful. They say you learn something new everyday and the cheese paper is one of them, who knew?!?! So enjoyed your picnic Deborah. I love to have special picnics especially with those I love. Will be on the watch for the cheese paper and thanks for the tip about how to wrap it. Have a wonderful week. Cute cheese paper indeed but the animal on the bottom, center-left looks like a dachshund to me. Wondering what cheese that would be. What a story your teacup told you, Deborah! I love it! And you've described the picnic that would be my favorite. Just lovely! Your friend's teacup is stunning, so beautiful. Loved seeing your rosemary too. I didn't grow any this year but will next year. Have a wonderful week, Deborah! Just a few more pounds . . .